Material and Finish: "Raven Black" steel posts with wood top rail. 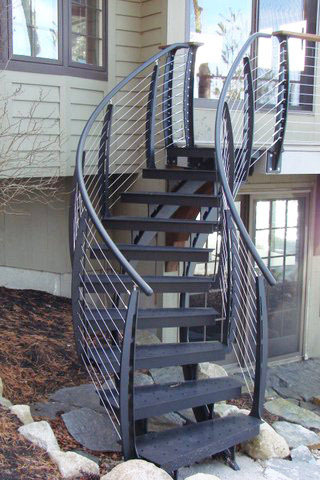 Description: Keuka Style cable railing and custom helical staircase. This home in Newbury, New Hampshire overlooks the beautiful Lake Sunapee and has the perfect beachfront backyard. 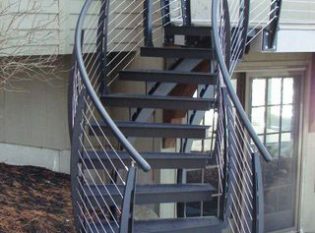 When the homeowners renovated their back deck, they decided they wanted a staircase that would lead to the backyard and give them quick access to the beach. Because the backyard already featured a stone landscape wall, our clients asked us to custom design a staircase that would extend from the deck and curve out toward the edge of the wall. 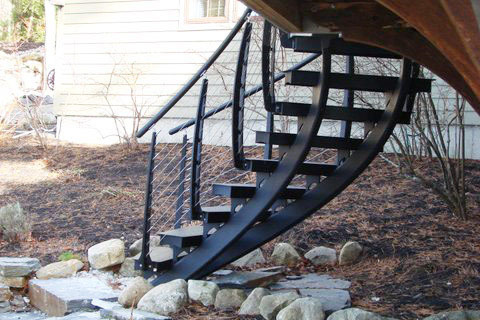 Keuka Studios custom fabricated a curved helical staircase with pie-shaped tread supports. 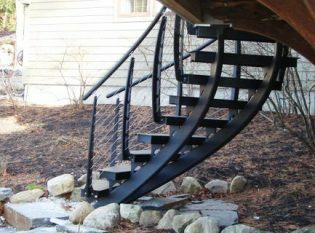 For the deck, we designed a matching Keuka Style cable railing system with “Raven Black” powder-coated steel posts and a wood top rail.